I have always enjoyed the many things that can be done with wood and have a deep appreciation for where the materials come from. I was a fine arts major in college and try to incorporate that influence in the pieces I make whether it's a bench, a playhouse or a hand carved pendant. I've spent a lot of time around people who appreciate trees, and if for one reason or another one has to come down, I like being able to turn it into pieces that can be enjoyed for years to come. The pictures on my site are just a small sample of what I do so check back for updates, or contact me if you have something in mind. These products are always unique, and always built to last. Thanks for taking a look! Check out the Cap Catcher Beer Caddy in Action!!! 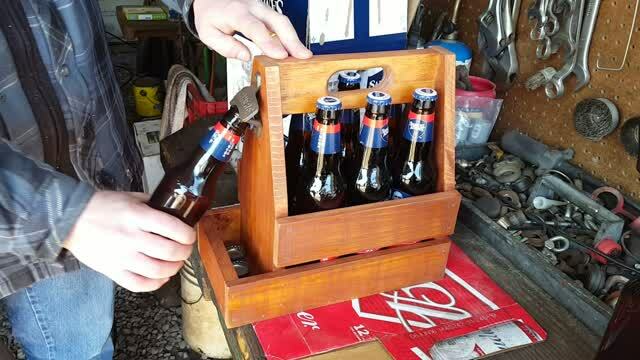 Click to Order Your Beer Caddy Today! Live Oak is a type of Oak tree used extensively in wood ship building in the United States beginning even before 1700. Growing primarily in the Southern United States, Live Oak is disease and decay resistant as well as exceptionally strong, making it a perfect choice for such a craft. Charlestown Naval Yard in Massachusetts is one of the oldest shipbuilding facilities in the United States having been established in 1801. Live Oak was used and stockpiled here until around 1880 when wood shipbuilding gave way to the practice of building ships entirely of metal. Ultimately, with the onset of war in the early 1900's, the Live Oak stockpiles were covered, and forgotten. Dating back to 1806, this collection of Live Oak was not rediscovered until 205 years later, in 2011. It was remarkably well preserved having been submerged in the briny salt water of the naval yard. Some of the wood was sent to Mystic Seaport to be used in the restoration of the Charles W. Morgan, the last of an American whaling fleet and the oldest of America's commercial ships to still be afloat. Parsons WoodCraft also found itself lucky enough to acquire some of this irreplaceable, and historic lumber. It is now being repurposed by Parsons WoodCraft into various projects in the hopes of helping to continue the story of this amazing resource and incredible find.